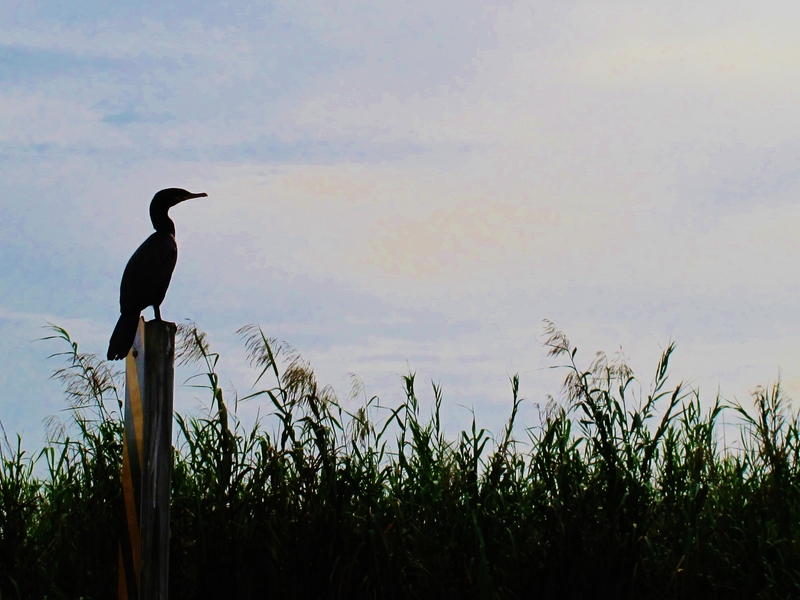 Neotropic Cormorant, Anahuac Wildlife Refuge, October 23rd. After spending most of 2015 in Oriental Asia, what better way could there be to round off an excellent birding year than to spend late autumn and early winter in the USA? I got pretty much straight back into “normal life” on my return from Vietnam, but today I made the most of an opportunity to get out of Houston. It gets light quite late here at this time of the year, not until 7.30am, and I made sure I was on the I-10 heading east shortly after 6.00am in order to try and beat the rush hour traffic. 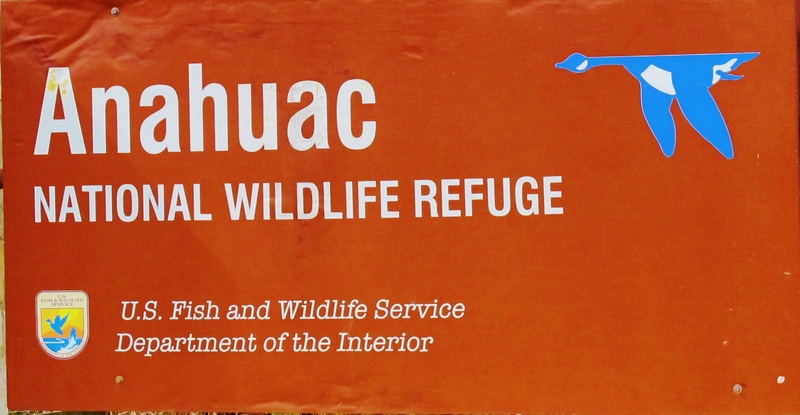 On the gulf coast of north-east Texas, a little more than an hour from Houston, Anahuac Wildlife Refuge is a flagship bird sanctuary. It is well known for hosting large numbers of wintering ducks, with up to 27 species possible on a midwinter day. In late October, the ducks have yet to arrive in force, but the area holds huge numbers of other birds including herons, ibises, raptors, and passerines. With this being late October, almost anything could turn up, and I was in a state of high anticipation as I made the early morning drive out from Houston. The good birding started before I even got into the reserve, when I spotted a couple of interesting-looking birds on a roadside wire. These turned out to be a Scissor-tailed Flycatcher and a late Eastern Kingbird. As I drove slowly along the road into the reserve, I saw several more of the former species on the wires, alongside large flocks of Brown-headed Cowbird and Red-winged Blackbird. On arrival at the reserve visitor center, the nearby boardwalk seemed a good place to start. I didn’t linger for long, as the local mosquitoes are particularly aggressive at that time of day, but before I retreated I saw several year ticks including a male Vermilion Flycatcher, Loggerhead Shrike, White-tailed Kite, a flyover Royal Tern, and a magnificent Boat-tailed Grackle. Probably the best area for birding is Shoveler Pond, around which a single-lane, one way road allows for great viewing of the marshes from the comfort of your car. At 7.45am I was the first person to drive along here for the day, which paid dividends in the form of an American Bittern flushed from beside the road and seen well in flight, and a Sora which lingered to eyeball me for a few moments before disappearing into the reeds. Shoveler Pond was literally teeming with birds, and the year ticks were coming thick and fast, with further highlights in the form of small numbers of Mottled Duck, Roseate Spoonbill, various herons including a single Tricolored Heron, a pair of Fulvous Whistling Ducks, and plenty of both White Ibis and White-faced Ibis in nearby marshland. 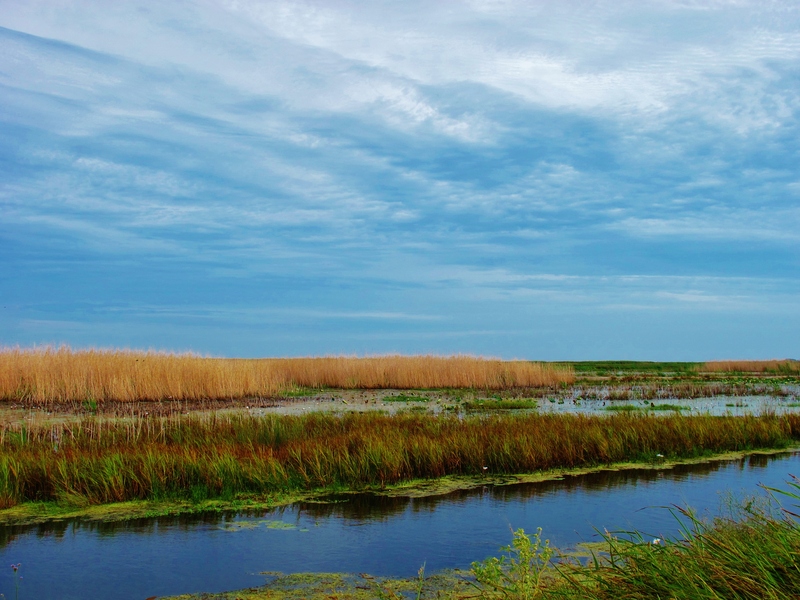 Next, I drove slowly south on the main road through the reserve, stopping where marshes became visible to the east. Here, there were two Bald Eagles (an adult and an immature), a fly-through Green Heron, and vast numbers of American Coot and other wildfowl – although unfortunately most of the birds were very distant and the viewing conditions looking into the sun weren’t ideal. At the end of the road, a small pool held some shorebirds including a Ruddy Turnstone, a Greater Yellowlegs, several Willets and a flock of Least Sandpipers. Offshore, Brown Pelicans, Laughing Gulls, and a few Forster’s Terns fished. Nearby, a juvenile Yellow-crowned Night Heron walked around on the edge of the road, and several Eastern Meadowlarks were seen in flight. Plenty of sparrows of various species inhabit the marshes and prairies at Anahuac, but every sparrow I got a look at turned out to be a Savannah Sparrow, which is abundant here. By late morning it was quite windy, so conditions for viewing passerines weren’t ideal. 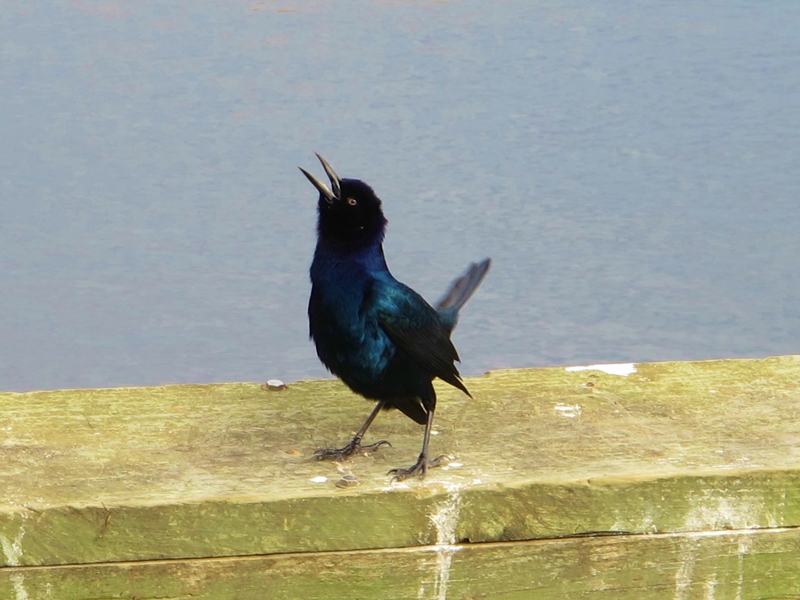 Boat-tailed Grackle in display mode. In the early afternoon, I took a drive out of the reserve to the Skillern Tract, which lies about 7 miles east of the main entrance road. Perhaps notable here was another male Vermilion Flycatcher, and a Common Yellowthroat. Along the way, I spotted a number of raptors in the air, so I stopped the car for a better look. They were mostly the two common vultures, but among them I found a Swainson’s Hawk (presumably on migration), and a Crested Caracara made an appearance too. Northern Harriers also seem to be very common in the area, with a minimum of 15 individuals seen today. I ended the day with 52 year ticks, including 7 lifers, which pushed my 2015 year list through the 1,000 mark, the first time I have seen this many bird species in a single calendar year. With more than two months left in Texas, Anahuac is one place I’ll be sure to return to – especially once the winter wildfowl have returned in force in a month or so. Lifers: Mottled Duck, American Bittern, White-faced Ibis, Roseate Spoonbill, Eastern Kingbird, Brown-headed Cowbird, Boat-tailed Grackle (total 2,015). 2015 Year Ticks: Black-bellied Whistling Duck, Fulvous Whistling Duck, Ruddy Duck, Ring-necked Duck, Blue-winged Teal, Pied-billed Grebe, Neotropic Cormorant, Brown Pelican, Great Blue Heron, Little Blue Heron, Tricolored Heron, Green Heron, Yellow-crowned Night Heron, White Ibis, White-tailed Kite, Bald Eagle, Northern Harrier, Swainson’s Hawk, Sora, Common Gallinule, American Coot, Black-necked Stilt, Greater Yellowlegs, Lesser Yellowlegs, Willet, Least Sandpiper, Ruddy Turnstone, Wilson’s Snipe, Laughing Gull, Ring-billed Gull, Forster’s Tern, Royal Tern, Belted Kingfisher, Crested Caracara, American Kestrel, Vermilion Flycatcher, Scissor-tailed Flycatcher, Loggerhead Shrike, Northern Rough-winged Swallow, Sedge Wren, Common Yellowthroat, Savannah Sparrow, Eastern Meadowlark, Red-winged Blackbird, Common Grackle (total 1,009). Early morning view from the road through Phong Nha-Ke Bang National Park. 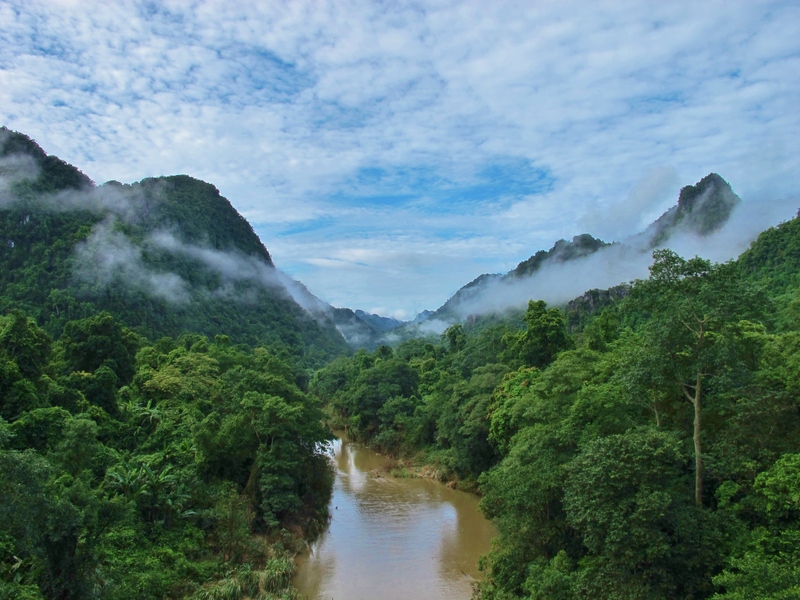 The limestone karsts in north-central Vietnam, and neighboring central Laos, are home to several species found nowhere else: Sooty Babbler, the recently split Limestone Leaf Warbler, and the newly discovered Bare-faced Bulbul (so far only confirmed in Laos). 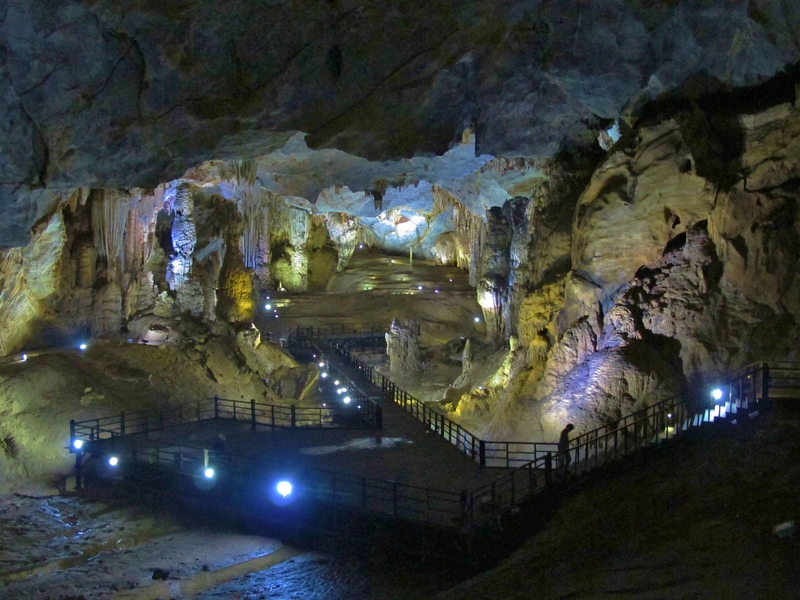 The Phong Nha-Ke Bang national park on the Vietnamese side of the border is renowned more for its caves than its birds, although the dramatic increase in tourist infrastructure in the area over the last five years means that several bird tour companies now visit. Nonetheless, most of the national park remains inaccessible to casual visitors, and further ornithological discoveries are no doubt waiting to be made here. The fairly new airport in nearby Dong Hoi makes the area easily accessible from Ho Chi Minh City or Hanoi, with our last-minute midweek flights from the latter city costing only around US$35 each. The excellent Phong Nha Farmstay can arrange a private transfer from the airport for 500,000VND (US$23); their accommodation is comfortable and nestled in a beautiful rural setting among the rice fields with views to the national park. Other accommodation options, from hostels to basic hotels, exist in Phong Nha village. Traffic in the area is light, and renting a motorcycle is a good way to get around – these cost around 150,000VND (US$7) per day from several outlets in Phong Nha village. The loop road through the national park is about 50km long, starting and finishing in Phong Nha village. I found the eastern section of the road to be the best, especially the last 3km before the four-way intersection at the southern end of the park. Another spot to try is further north on the same road, where there is a wide track shortly before the steep descent. This track passes through several forest fragments – I had a group of three Siamese Firebacks along here in the early morning and a party of Wreathed Hornbills passing overhead, and it would probably be a good spot to try for a Blue-rumped or Bar-bellied Pitta. 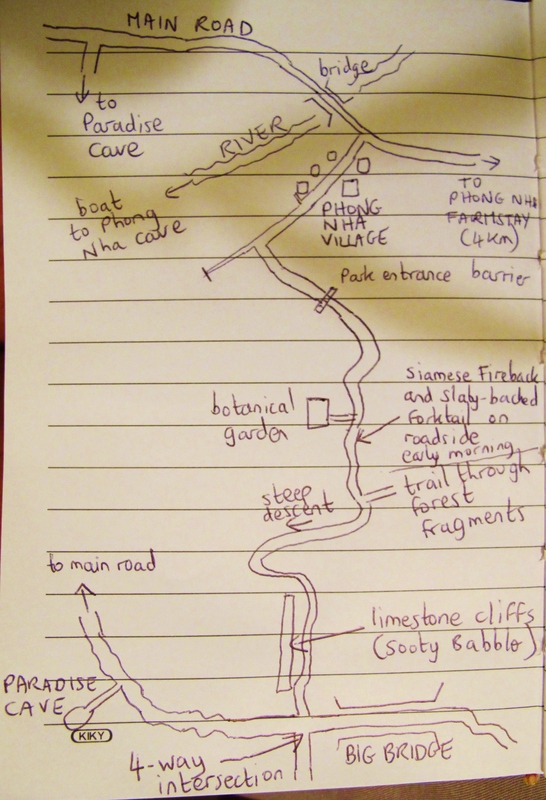 Very basic sketch map of the area, which may be useful to some! Opportunities to get deep into good habitat are very limited, but fortunately the road passes through some nice spots where some of the key species can be observed. The big bridge next to the four-way intersection is also worth a bit of time, as views from here are good. I didn’t manage to get very close to any limestone outcrops, where the two main target species reside, but I was lucky with Sooty Babbler: 3-4 birds showed fairly well but distantly on an outcrop about 2km north of the four-way intersection. Another possibility for this species would be the trail to Paradise Cave, which passes through some good forest, but the downside is having to pay a 250,000VND fee to access the trail. Birding was generally fairly slow, with moderate levels of activity from first light until about 9.00am, then it became much quieter, with long periods in the afternoon when I saw and heard almost nothing. I saw 57 species in total during two early mornings and one afternoon birding in the park. I was told that the birds were formerly much hunted for food in this poor region, but rapidly increasing prosperity has led to a decline in hunting – one can only hope that this assessment from a local resident is indeed true. 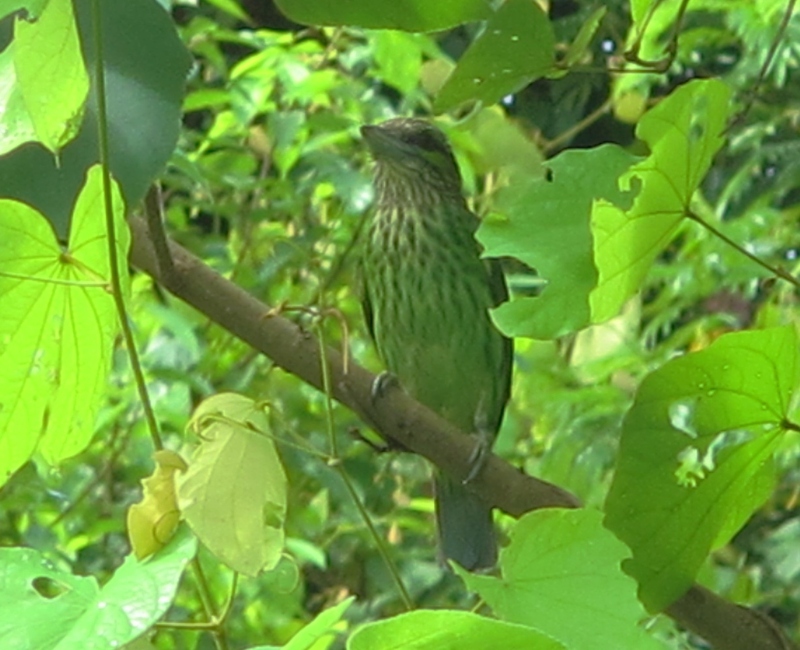 Key species missed: Limestone Leaf Warbler, Red-collared Woodpecker. Lifers: Sooty Babbler, Black-browed Fulvetta (total 2,007). 2015 Year Ticks: Siamese Fireback, Slaty-backed Forktail, Dusky Crag Martin (total 927). Paradise Cave is very impressive and well worth a visit, even though there are no birds in there.